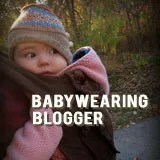 ← Time for Cold-Weather Babywearing! Quality articles is the secret to interest the visitors to visit the site, that’s what this web site is providing. I would just like to say thankyou for such a thoughtful take on baby carriers and FFO positions! I recently had a friend call me out as being a baby dangler….and I have a Baby Bjorn One carrier, which by the way, is not a baby dangler. Anyways – I mistakenly also emailed my ‘sling mama’ group to get their opinion and received some crazy responses from crazy ‘anti baby leg dangler’ moms(who, by the way, happen to sell ergo baby carriers…). Anyway, I did realize I had not unzipped the ‘newborn’ position which was causing my babies legs to dangle a bit, but I am very glad to know that she is now in a safe ergonomic position and in general there are many more contributors to hip displaysia and there is no proof that wearing certain baby carriers is one of them!